What’s in the New Russia-Philippines Navy Pact Chatter? A closer look at a recently discussed development in the defense relationship. Last week, during a scheduled meeting between the Russian and Philippine navy chiefs, both sides discussed the inking of a new naval pact. While this pact has long been talked about and specifics remain unclear, it nonetheless put the spotlight on the interactions between the two sides in the defense realm under Philippine President Rodrigo Duterte’s perceived “pivot” to Russia as part of his wider independent foreign policy. As I have observed previously in these pages and elsewhere, one of the consequences of Duterte’s so-called independent foreign policy, which seeks to boost the country’s outreach with countries like China and Russia, has been the slow but sure development of Russia-Philippine defense relations, despite the challenges that still exist. That includes the maritime realm, where interactions have included visits by vessels on both sides and talk about Moscow providing some potential maritime-related equipment and expertise to meet some of Manila’s needs. That has continued over the past year or so as well. A case in point was the first-ever port visit of Philippine naval vessels to Vladivostok in Russia in October, which was viewed as a boost for ties. Interactions also got underway early on in 2019, with three Russian vessels arriving in the Philippines for a goodwill visit in early January. As this has been occurring, one of the items that the two sides have been in talks about is the conclusion of a naval cooperation agreement. While there has been talk about this before — discussions officially began last year during Philippine navy chief Robert Empedrad’s trip to Russia — up till recently we did not have a concrete sense of when this would actually be signed and what it would contain. 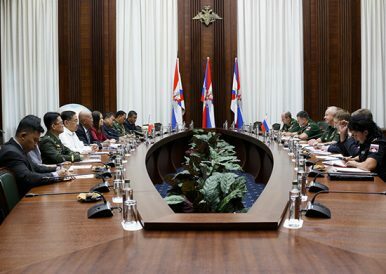 Last week, a few more specifics were publicly disclosed during the visit of the Russian Navy chief Admiral Vladimir Korolyov to the Philippines, where he visited several Philippine defense officials including Armed Forces Chief of Staff Benjamin Madrigal Jr., Defense Secretary Delfin Lorenzana, and Empedrad himself. While there were several developments discussed during a courtesy call between Korolyov and Empedrad – from the donation of old Russian ships and aircraft to the prospect of more naval visits – one topic was a potential naval cooperation agreement. Per Empedrad’s comments to reporters last Thursday, the agreement, which has been finalized, will be sent around for alignment within the Philippine government, with initial indications that it will be signed in Russia in July. The agreement will set out areas for collaboration between the two navies, including areas such as port visits, training exercises, and joint consultations. Even though Russia-Philippine defense collaboration is still very much at a basic level and amounts to far less than the hype that often accompanies it, the naval pact is nonetheless not without significance. It marks yet another step in the development of ties in this realm, and it also institutionalizes ongoing collaboration during the tenure of Duterte, who is personally fond of boosting the relationship. Unsurprisingly, few specifics were publicly disclosed about the nature of the pact. But as we see other defense interactions take place between Manila and Moscow in the coming months, including scheduled staff-to-staff talks in Manila in June, we can expect to hear more about the nature of this navy pact and how it may affect the overall trajectory of ties. A closer look at the much-anticipated agreement that both sides finally inked last week.